CNET UK has reviewed a flagship camcorder from Canon. The camcorder is called Canon Legria HF G10 and supports full HD AVHCD recording with 32 GB of internal memory and lots of other features. CNET UK ends up giving the Legria HF G10 an overall score of 4 out of 5 possible stars. On the positive side the reviewer finds several aspects including very good image quality, the camcorder is good in low light situations, you get a lot of storage space and manual controls is a nice addition. There are a few negative issues like high price tag, large size and there is no 1080/50p mode. If you are looking for a consumer camcorder with the best video quality this Canon might be your choice, but you have to pay quite a bit of money and the camcorder is not very pocketable. 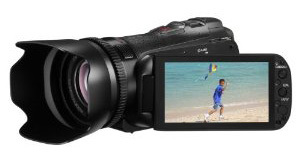 Read the full review of the Canon Legria HF G10 HD camcorder here.